Physicians and other healthcare providers operate in an industry that is different in many ways. The practice of medicine is heavily regulated, subject to increasing competition and decreasing reimbursement, and affected by market factors that may seem a mystery to the average physician. While you are engaged in the day-to-day operations of treating your patients and supervising your staff, it may be impossible for you to find the time or access the expertise necessary to address the complex issues your practice faces. Trout, Ebersole & Groff, LLP has the time and the expertise to help. We have been helping healthcare providers solve their practice management problems for over 70 years. Our consultants and accountants understand the business of medicine and we can help you understand it as well. The professionals of Trout, Ebersole & Groff, LLP can also assist in the areas of strategic planning, governance and organizational dynamics, human resources management, information technology, and marketing. 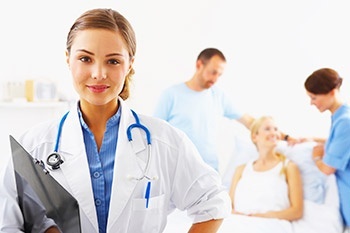 We also provide our healthcare industry clients with the finest in accounting and tax advisory services. Our commitment to timely, value-added service helps our clients maximize their success. Benchmarking uses measurement and comparison to promote efficient management by analyzing your practice's performance in comparison to that of your peers, evaluating specific work processes, costs, and compensation levels, and assessing billing and collection outcomes. Assessing appointment and scheduling systems, improving billing and collection policies, developing and managing ambulatory surgery centers, measuring clinical outcomes and efficiencies, improving patient flow systems - these are just some of the areas in which Trout, Ebersole & Groff, LLP can help your practice operate more profitably. Creating profit maximization strategies for healthcare providers includes assistance in the areas of billing and collections, managed care plan participation, revenue enhancement, denial management, coding and documentation, physician and staff compensation, retirement and succession planning, practice valuation, and many other pressing concerns. Protecting your practice as it navigates an increasingly hostile regulatory environment includes assistance with Medicare compliance plans, billing and compliance audits, HIPAA requirements, federal anti-kickback statutes, OSHA safety programs, and patient, and workplace safety programs.